Tesla announced on Thursday that it will only sell its electric cars online to allow it to market its Model 3 vehicle for $35,000 (circa £26,335) in the US – down from $44,000 (circa £33,200). As a result, the Silicon Valley company said it would be ‘winding down many of our stores’ over the next few months, with ‘a small number of stores in high-traffic locations remaining as galleries, showcases and Tesla information centres’. The firm’s website lists it has having 20 stores in the UK and Ireland, some of which are combined with service centres. This includes 10 sites in and around London, two in Birmingham, two in Greater Manchester and locations in Bristol, Milton Keynes, Cambridge, Leeds, Edinburgh and Dublin. Its website also lists sales representatives in Aberdeen, Glasgow and Newcastle, and other service centres in Milton Keynes, Bristol and Edinburgh. 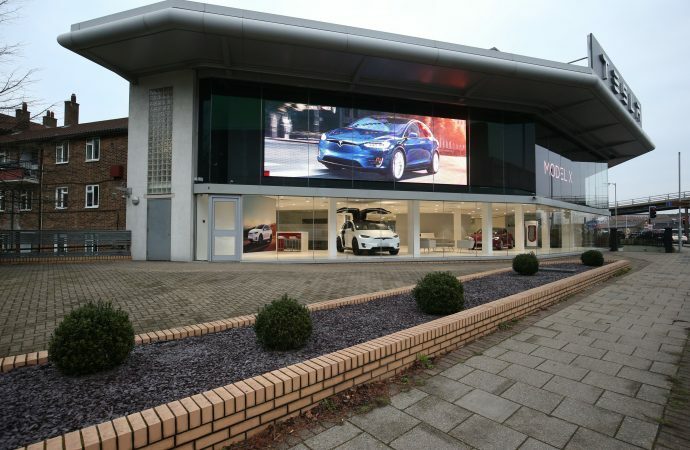 A spokesperson for Tesla was unable to provide details of how the company’s plans might affect its operations in the UK and Ireland. Tesla chief executive Elon Musk wants to produce a mass market sedan at the $35,000 price point to help the company reach more consumers and generate greater sales. The online sales shift will enable Tesla to lower all vehicle prices by six per cent, on average, including its higher-end Model S and Model X.
Mr Musk said: ‘This is the only way to achieve the savings for this car and be financially sustainable. The store closures come on top of a decision to cut 3,150 jobs – about seven per cent of Tesla’s workforce – announced earlier this year. The Model 3 is currently not on sale in the UK, with right-hand drive markets due to begin in the second half of this year but the car can be reserved online with a £1,000 deposit.